I had never won a promotion before through Twitter, but when SA-GE Collectibles announced a giveaway, I had to take a shot downfield. SA-GE was looking to see fans player collections, so I emptied my binder of all my SA-GE autographed cards and sent them a photo. Pretty soon thereafter I was followed by a few copycats, but the message had been sent, and I made an impression. A few weeks later I received 2 cards. I thought that I’d get an Alfred Blue card, but lo and behold I received this awesome Todd Gurley card along with a really nicely designed Anthony Harris card. After thanking SA-GE for the card, I was spammed by a few interested buyers, but I’m not in it to sell it. 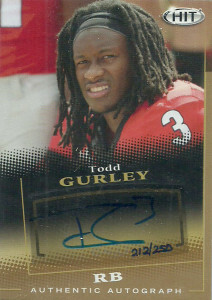 I had been following Todd Gurley for a while. On my long drives to Houston for Texans signings, I had listened to pundits talk about how good he was and his numbers spoke volumes. Although injuries derided his 2013 and partially his 2014 campaign, Todd graded out rightfully so with a first round grade. In 3 years at Georgia, Todd rushed for 3285 yards on 510 carries with 36 TDs. Considered a rare blend of speed and power, Gurley would have been the #1 overall pick if not for an ACL injury that sidelined him for the remainder of the 2014 campaign and through the combine. The St. Louis Rams looking for that bell cow back selected Gurley with the 10th overall pick of the 2015 draft. Todd got on the field near the end of September against the Steelers, and had his first bust out game against the Cardinals the following week rushing for 146 yards on 19 carries- the first of four straight 100 yard games. He scored his first TD against the Browns on 10/25 and finished with 1,106 yards on 226 carries and 10 TDs, propelling Gurley to the Pro Bowl and NFL Offensive Rookie of the Year Honors.